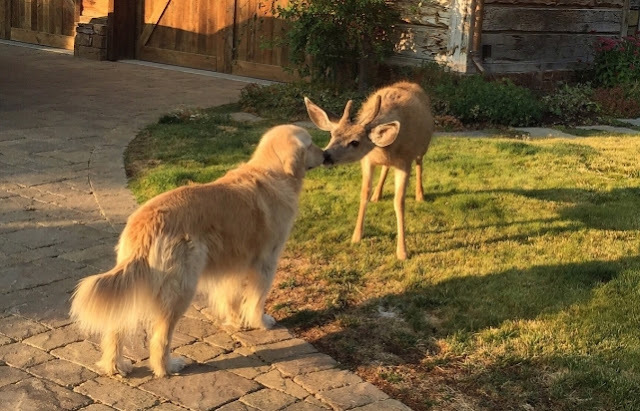 Special photos show the moments of the meeting, as the deer cautiously approaches the dog and stretches out to bump his nose. While these two might not ever see each other again, their sweet moment of friendship reminds us just how much we share with our neighbors in the wild. Note: Helpful Tips For Welcoming Wildlife To Your Garden: Many people don't welcome wildlife in their gardens. They shouldn't try to keep wildlife away from their back yards. These furry and winged critters bring beauty and nature to your property and are a living proof that the place is safe. They are interesting to watch and your plants can only benefit from their presence. Provide fresh water - Offer shelter and cover (for birds)- Keep your garden clean (chemical-free and GMO-free garden)- Don't forget that you shouldn't scare those delicate creatures. Any sudden moves or loud noises can startle them and they may never come back to your place. Responses to "Magical Moment Deer Meets Dog, Leans In For Kiss "